This post is quite overdue, but at least I’m getting to it now, right? The recipe in this episode of Good Eats involves the use of a pressure cooker. Thankfully, my parents had given me a pressure cooker for Christmas years ago when I was trying to start a personal chef service. Note: personal chef services do not tend to do well in very small college towns. 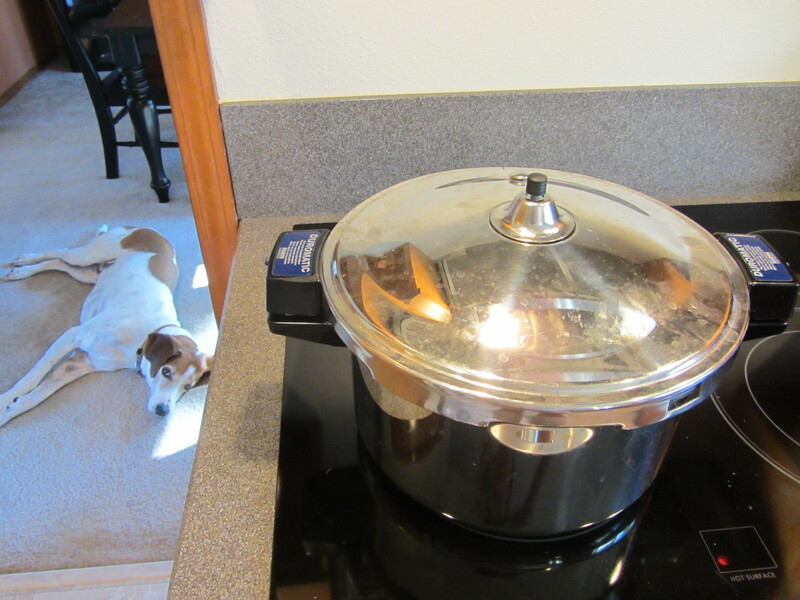 I have loved my pressure cooker when I have used it, and I surely have not used it enough. My mother-in-law tells the story of her pressure cooker exploding years ago when she was cooking beets. Red beet juice was everywhere. Modern pressure cookers are safe and efficient, and work wonderfully for fast cooking of otherwise slow-cooking foods. In this episode of Good Eats, Alton’s TV sister has a nasty case of the flu and asks him to make some broth for her. I figured the timing of this recipe was perfect as my husband was in his second week of chemo and radiation. To start, Alton clarifies the difference between a stock and a broth. A stock, you see, only requires water and bones. 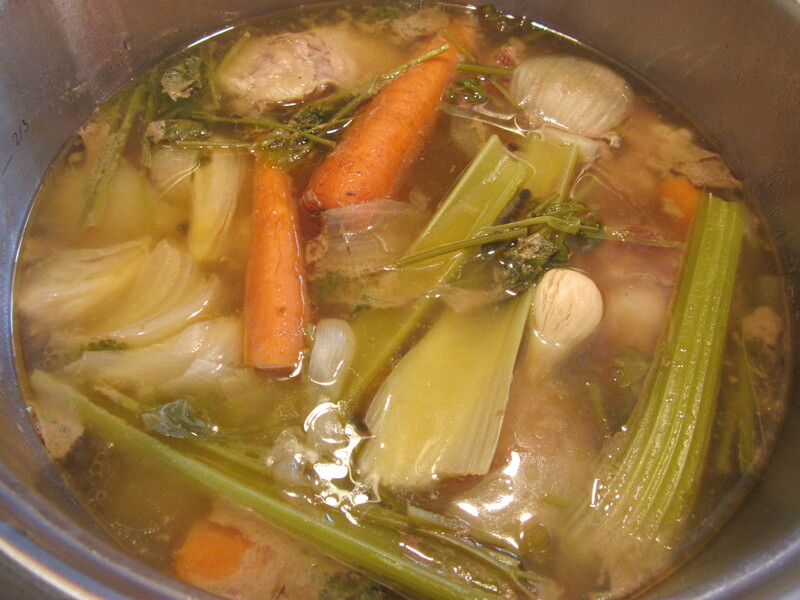 A broth, on the other hand, is water with meat or vegetables, and the meat and veggies are strained out. If the meat and vegetables are left in, you have a soup. 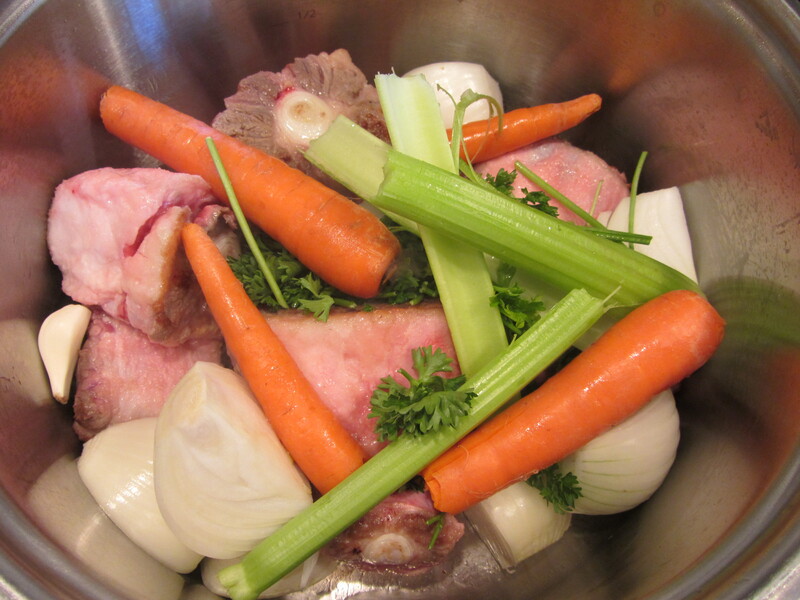 To make Alton’s recipe for beef broth, you will need a total of three pounds of beef shank and oxtail, ideally in equal proportions. 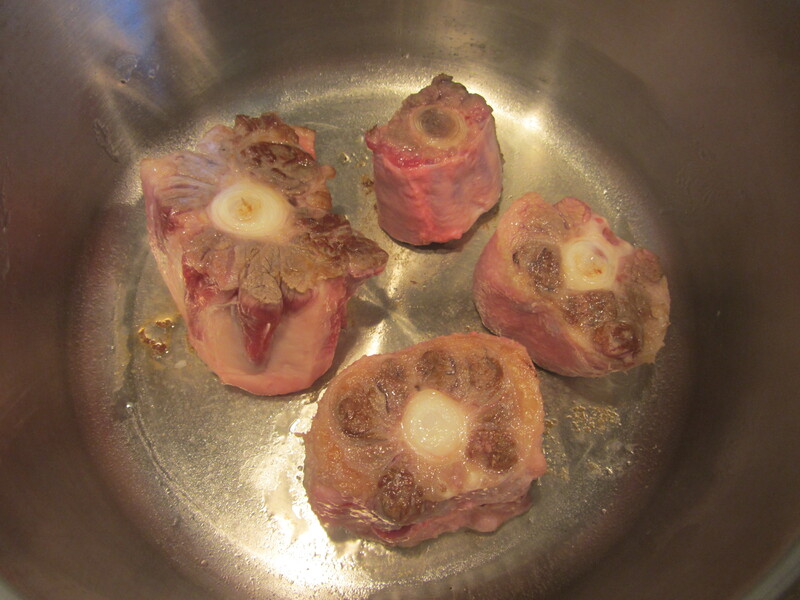 I tried to find beef shank in numerous stores and at the butcher shop, but with no luck, so I ended up using all oxtail pieces. 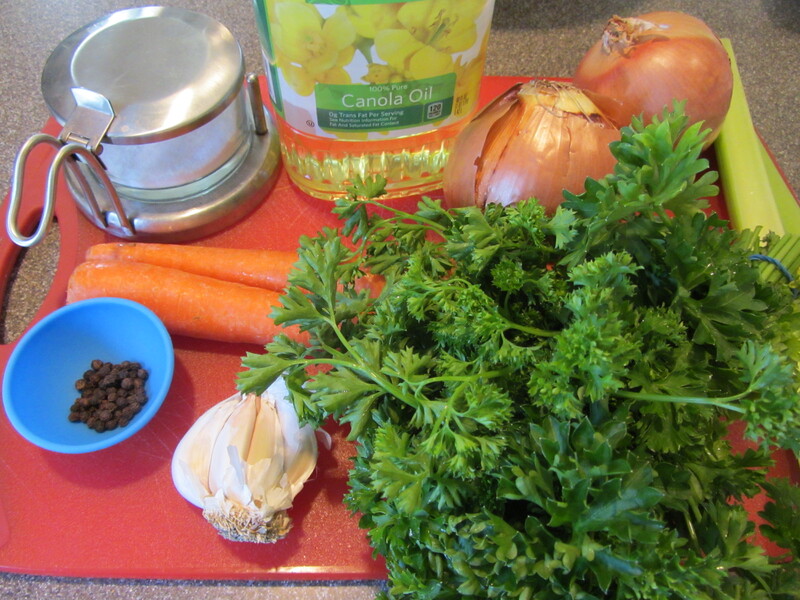 Ingredients for Alton’s beef broth: Kosher salt, canola oil, onions, black peppercorns, garlic, carrots, parsley, and celery. Not pictured: beef pieces and water. 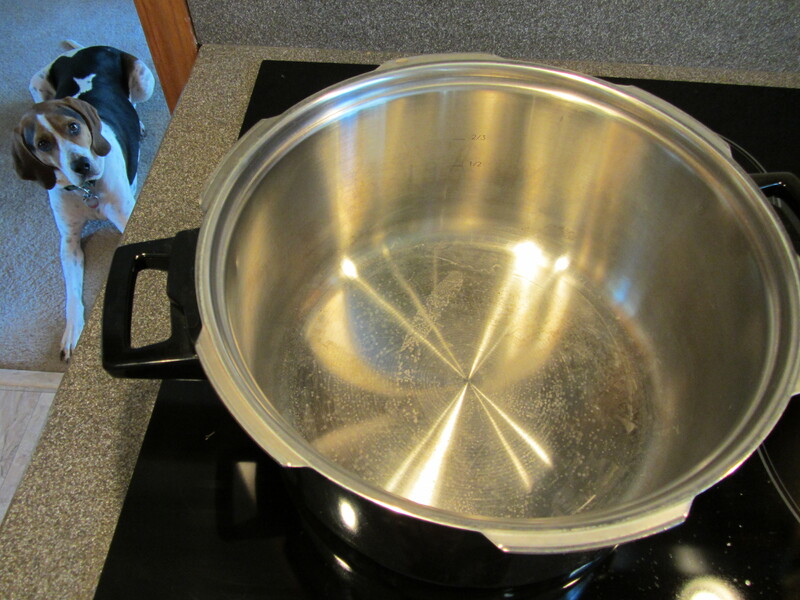 To start, heat your pressure cooker over high heat. 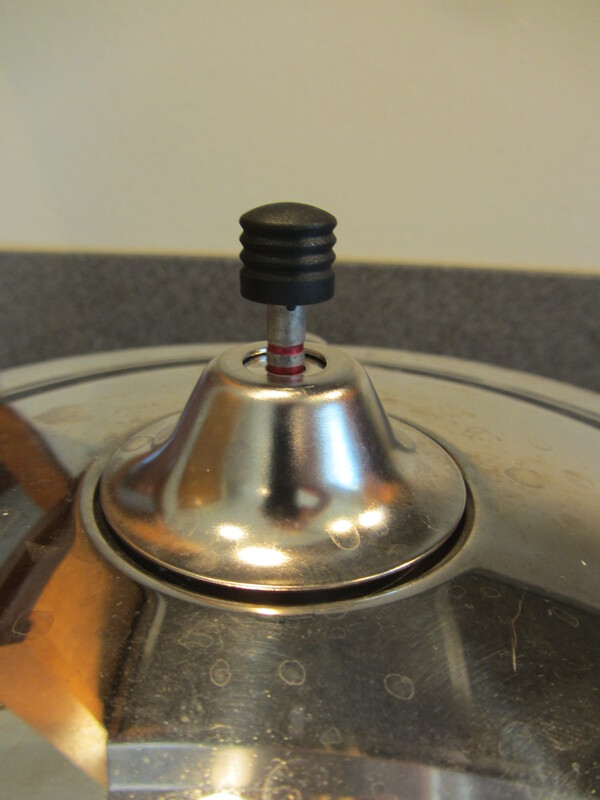 Pressure cooker heating. Dog waiting. 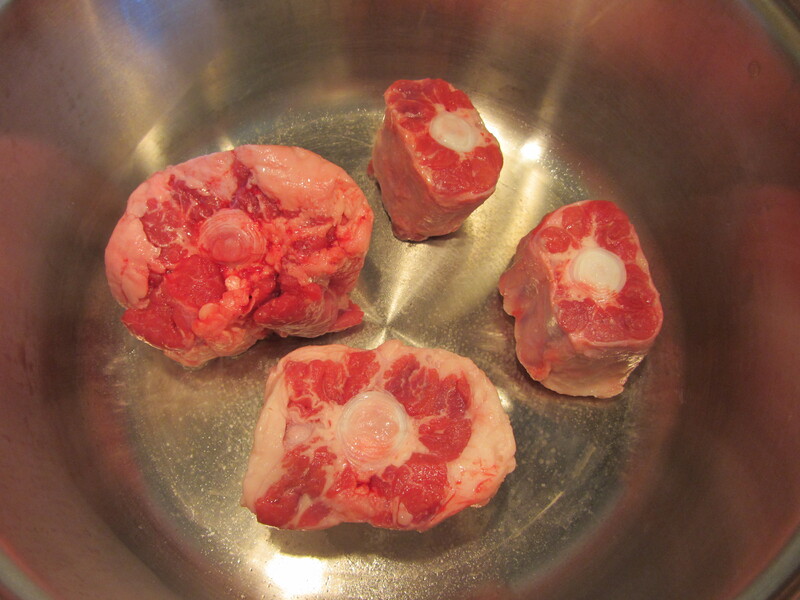 While the pressure cooker heats, put the meat pieces in a bowl and drizzle them with canola oil. Sprinkle them with 1/4 t Kosher salt and toss them to coat. 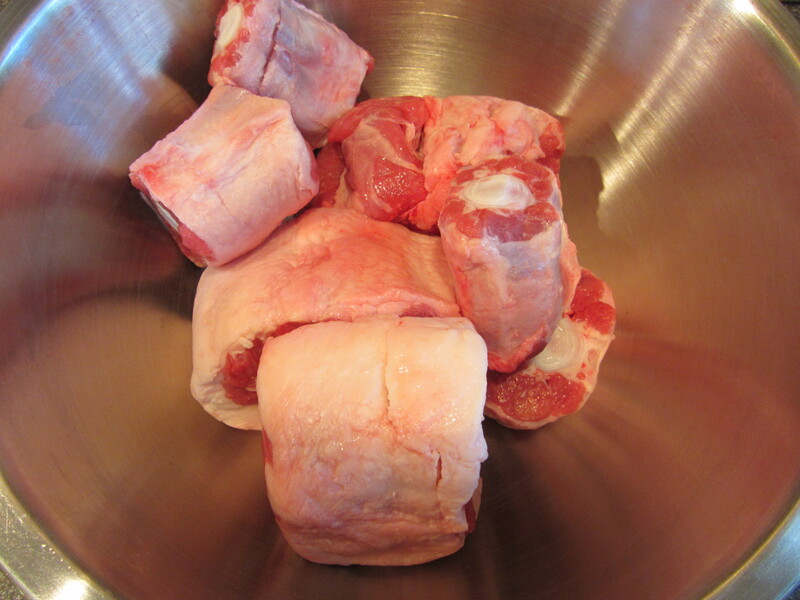 Three pounds of oxtail pieces in a bowl. Meat pieces tossed with canola oil and Kosher salt. Alton explains that the oil acts as a conductor, while the salt serves to add flavor and pull out “protein-laden juices.” Once the pressure cooker is hot, add the meat pieces, leaving an inch between them. You will want to do this in a couple of batches, as you don’t want to overcrowd the pan. 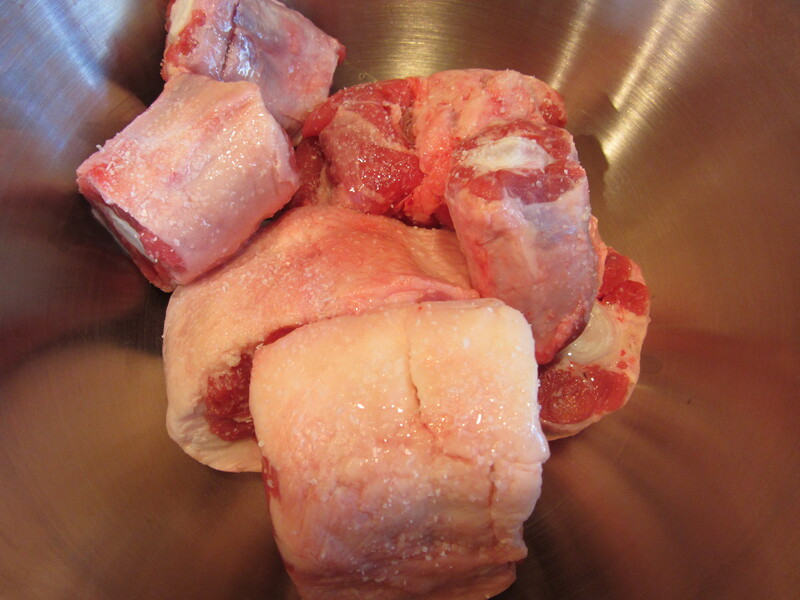 Meat pieces into the pressure cooker. Turn the meat pieces with tongs, letting them sear on all sides before removing them from the pan. Searing the meat on all sides. Remove any excess fat from the pan with a wad of paper towels. Excess fat to be removed with paper towels. Next, add the meat back to the cooker, along with two quartered onions, two celery ribs, two carrots, a handful of parsley stems, two cloves of garlic, and 1 t black peppercorns. 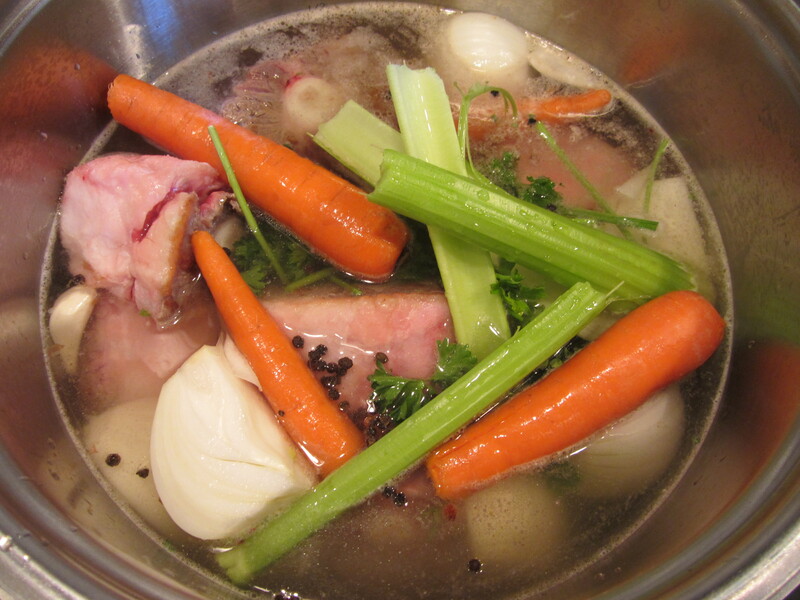 Meat, onions, celery, carrots, parsley stems, garlic, and peppercorns added to cooker. Also add two quarts of water, making sure your pressure cooker is filled no higher than 2/3 full. Two quarts of water added to cooker. Bring the liquid to a boil and skim the protein foam off of the top. Protein foam to be skimmed off of the top. 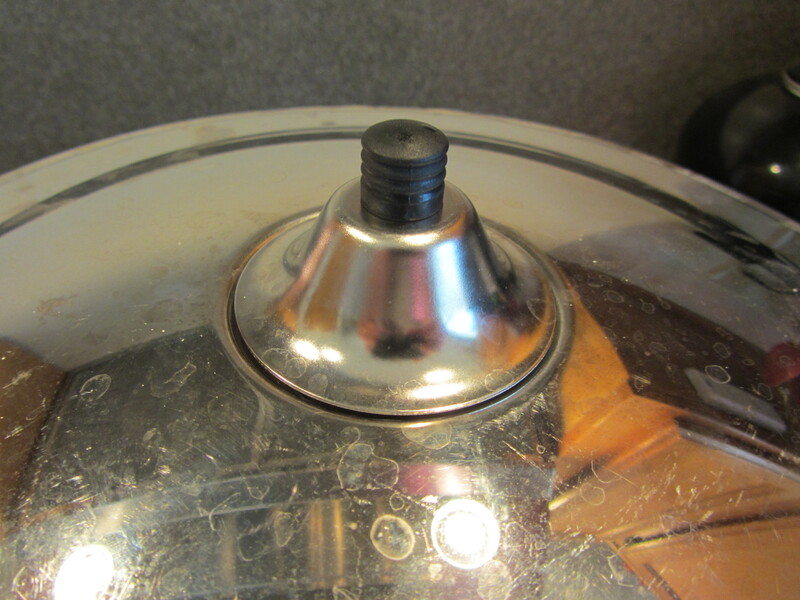 Lock the lid on your cooker and bring it to full pressure. Cook for 50 minutes. Lid on the cooker. Other dog waiting. Pressure cooker at full pressure for 50 minutes. 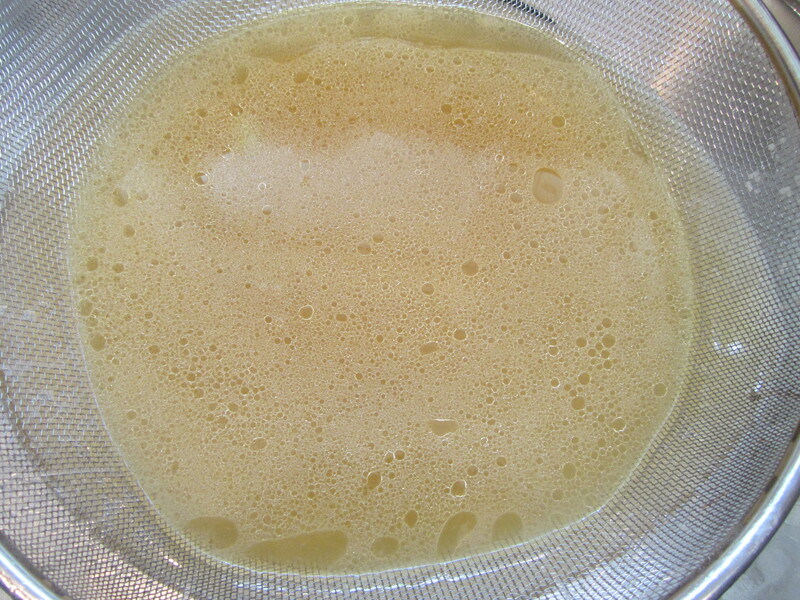 Once cooked, release the pressure from your cooker and strain the broth through cheesecloth. Pressure released after 50 minutes. 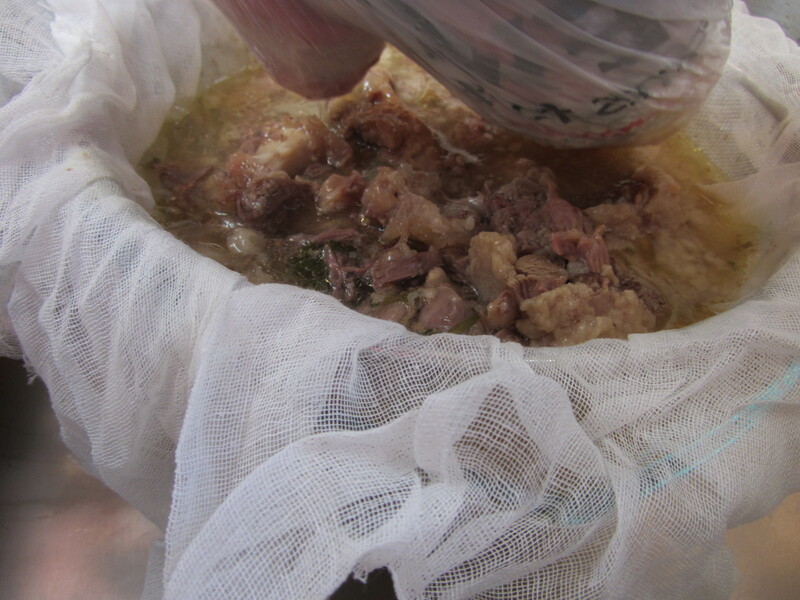 Straining the broth through cheesecloth. Using an oven mitt wrapped with a plastic bag, squeeze the meat to get all of the juices out. Squeezing the juice out of the meat pieces. 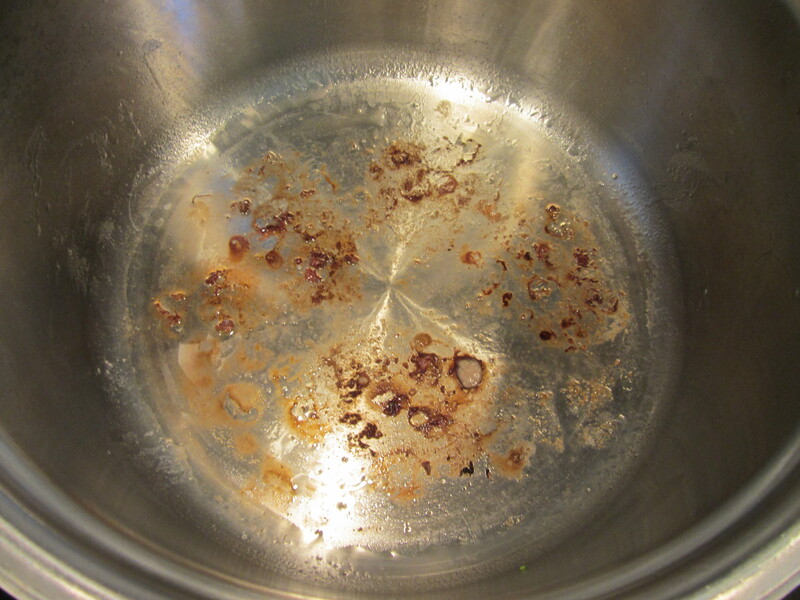 Alton told you to strain your broth a second time, but my broth looked very clear and I skipped the second straining. 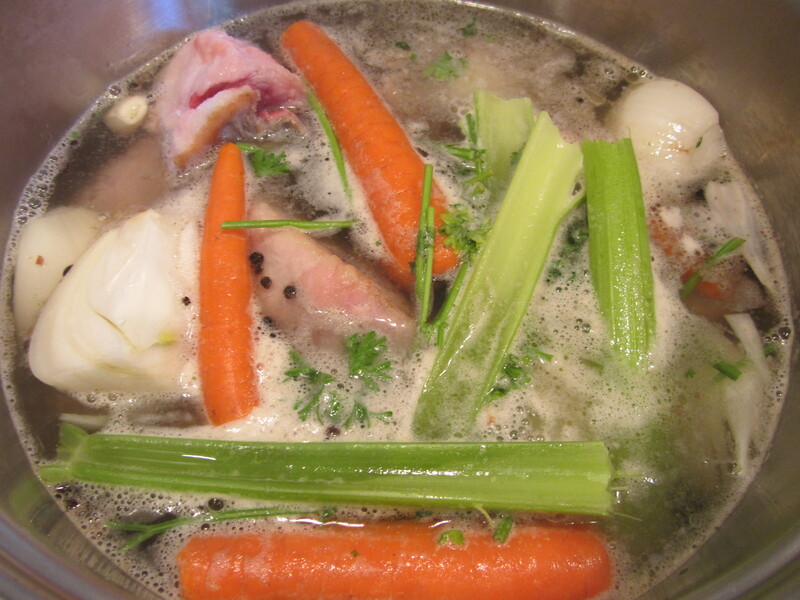 The broth will have a fair amount of fat on the top. 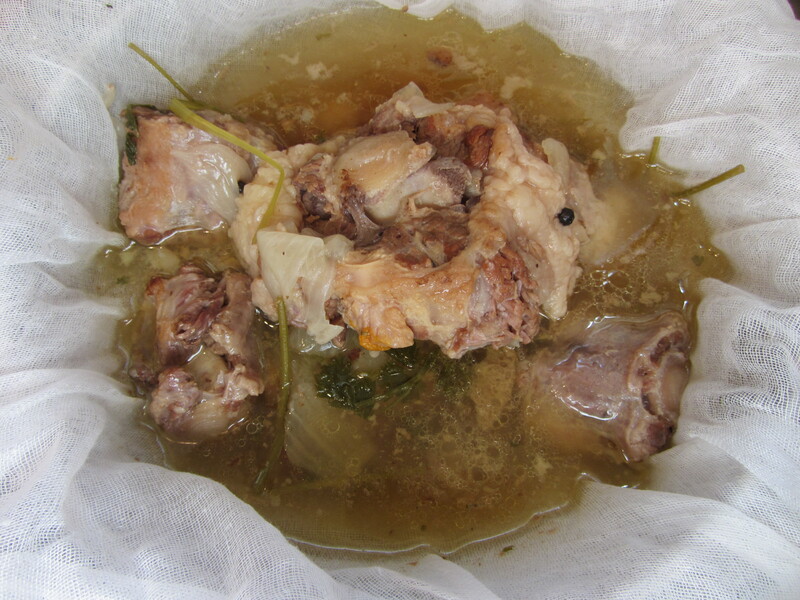 You can get rid of the fat by transporting the broth to a new container, using a gravy separator and discarding the fat. 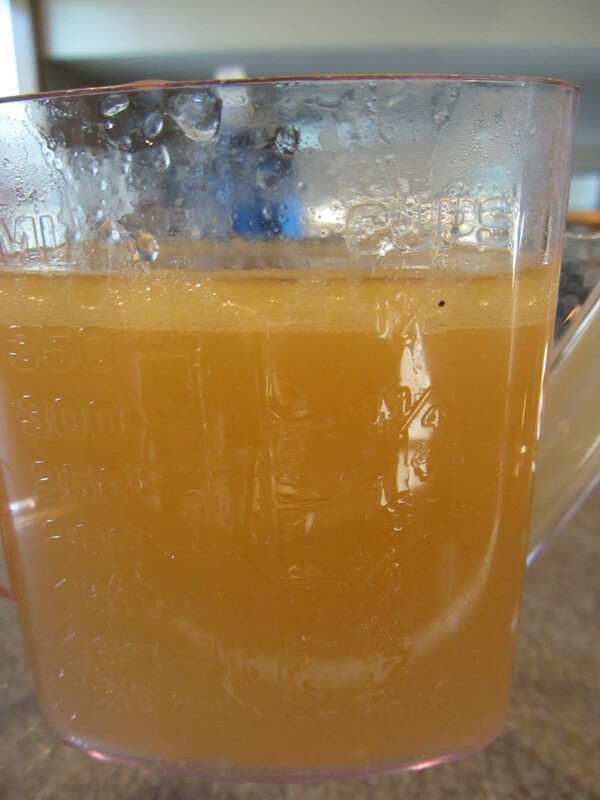 Using a gravy separator to discard the fat from the broth. At this point, taste your broth and season as necessary. 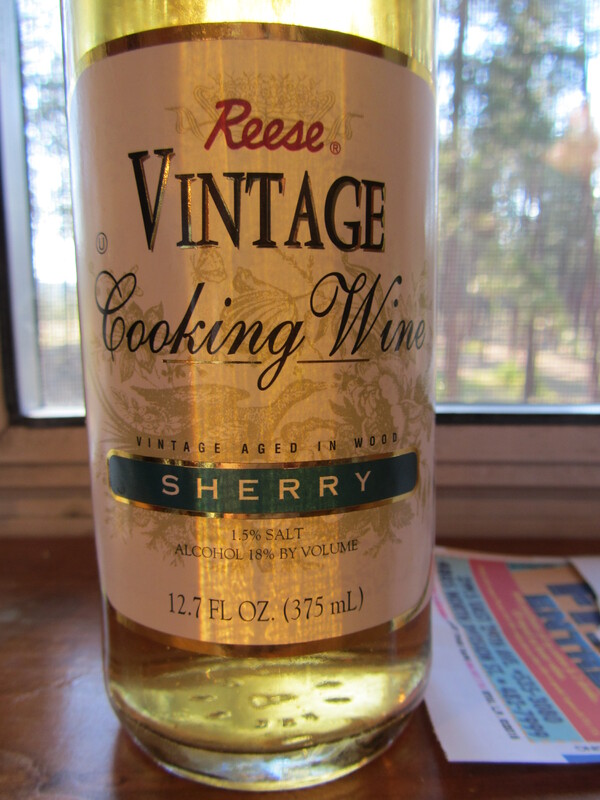 Alton recommends salt and sherry for seasonings, or you could add lemon juice. My broth needed quite a bit of salt, and I added a few dashes of sherry. You can eat the broth as it is, or you can use it as a base for soups. We both had a mug of broth as soon as it was ready, and it was delicious. It had loads of meaty flavor, a rich mouthfeel, and really tasted of umami. The sherry really served to enhance the beefy flavor. We froze the rest of our broth for later use; I anticipate that some of it will be consumed plain and some will be used to make soup. If someone you know is sick or looking for good old-fashioned comfort food, Alton’s beef broth should be on your list.